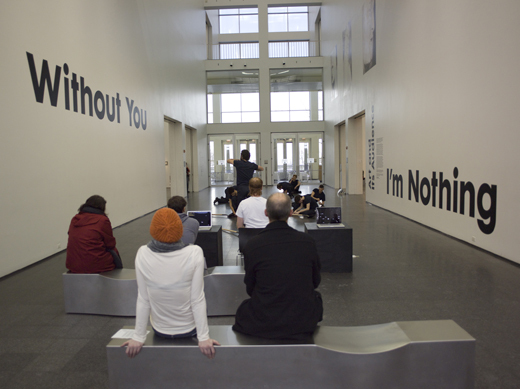 Without You I’m Nothing: Art and Its Audience, exhibition at the Museum of Contemporary Art, Chicago (Photo: Nathan Keay). new course for fall 2016 @ northwestern university: cultural criticism and the contemporary museum. What is the history of cultural and arts criticism in the United States? Where is it headed today? This methods course combines historical examination with fieldwork in the setting of a contemporary art museum. Students read extensively in the history of cultural criticism while experimenting with new, digital modes of this kind of writing. The course convenes in seminar format once a week on the Evanston campus (Thursdays) and once a week at the Museum of Contemporary Art, conveniently located across the street from the Chicago campus’s stop for the free Intercampus bus (Tuesdays, when the museum is open late and free to the public; other trips to the MCA will be required to complete assignments as well). Tuesdays are dedicated mostly to independent work at the museum, with occasional meetings at 5 pm (you can enroll in a course that ends at 3:20 pm on Tuesdays and still get to the MCA on time for work there). Thursdays we convene on the Evanston campus from 3:30 – 4:50 pm. 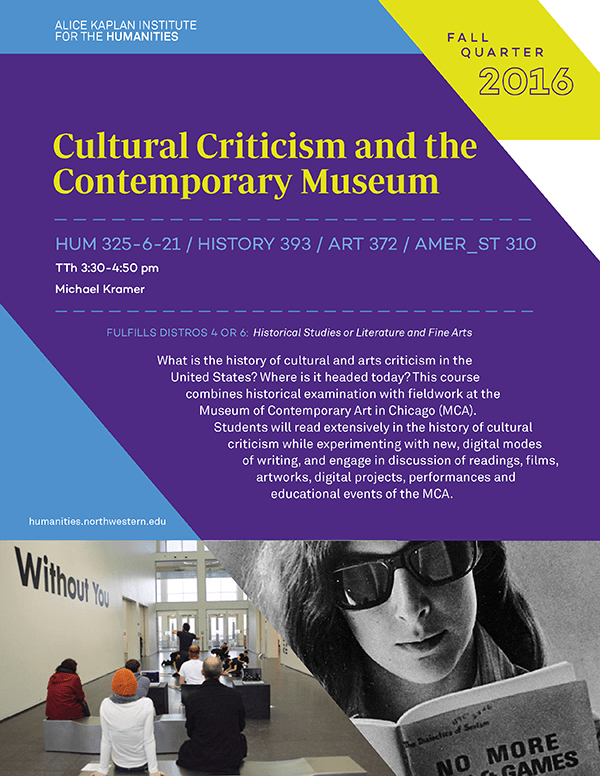 Over the course of the quarter, we will meet with staff of the MCA to learn more about working in a museum; Northwestern faculty whose work examines some aspect of cultural criticism will join us as well. Expect extensive discussion of readings, films, artworks, digital projects, performances, and more. Assessment in the course revolves around multimedia modes of digital cultural criticism written about the MCA Chicago’s exhibitions, performance series, educational events, and more (no extensive computer experience required, just a willingness to spend time at the MCA and dive in and experiment with digital approaches to cultural criticism). Selections of student work will potentially appear on the MCA’s official blog, MCA DNA. The course concludes with one final, scholarly, multimedia essay on a topic related to the contemporary museum, cultural and arts criticism, and a student’s particular interests.